Foreign automakers in Mexico cranked out 943,704 new cars and light trucks in the January-March period, with output rising by 36 percent alone in March to 363,687 vehicles, the Mexican Automotive Industry Association says. OTTAWA -- The auto sector rates nary a mention in the published list of U.S. objectives for the renegotiation of the North American Free Trade Agreement. But senior Canadian officials privately believe the automotive industry is actually at the root of American demands for changes to NAFTA and will be the key to the success — or failure — of negotiations to revamp the trilateral deal. Donald Trump, they note, rode a wave of anti-trade sentiment to victory in last fall's presidential election, propelled by an unabashedly protectionist, America-first agenda, including a threat to rip up NAFTA, which he called "the worst trade deal in the history" of the United States. It was a populist message that tapped into long-simmering resentment over the exodus of American manufacturing operations — including the Detroit Three automakers and auto parts plants — to Mexico. And it resonated particularly loudly with voters in the 14 auto-producing states, 12 of which ultimately delivered their electoral college votes to Trump. Now, Canadian officials believe the success of the NAFTA renegotiation, set to start Aug. 16, hinges on Trump's ability to claim a win on the auto front. And they believe the route to that victory lies in stricter labour and environmental standards to minimize Mexico's low-wage advantage. Mexico buys just eight per cent of North American-made vehicles but employs 45 per cent of the continent's auto workers. 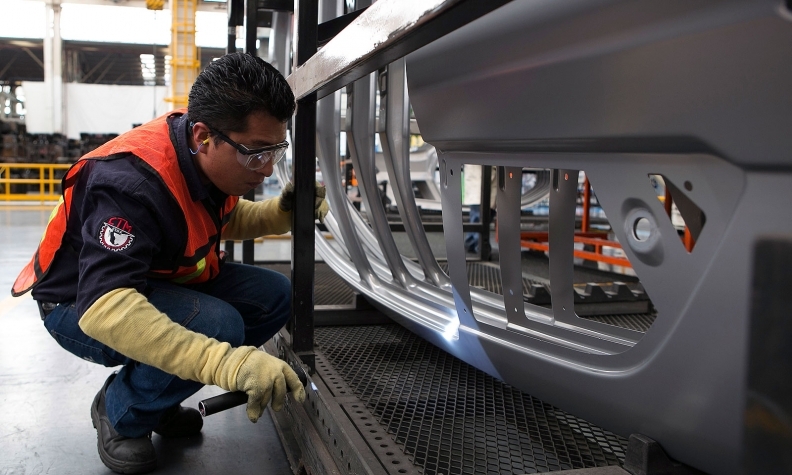 Since NAFTA came into effect in 1994, four assembly plants in Canada and 10 in the United States have closed; eight new plants have opened in Mexico. U.S. and Canadian vehicle and auto parts trade deficits with Mexico have grown exponentially — a four-fold increase for Canada, from C $1.6 billion pre-NAFTA to C $8.7 billion now. And all those disturbing numbers are explained by another stark statistic: Mexican autoworkers earn an average of about $4 per hour, compared to $30-$35 per hour in the U.S. and Canada. Rebalancing the auto industry so that all three countries get a fair share of investment and jobs "will be the biggest piece of the puzzle, I would suggest, in NAFTA," says Unifor president Jerry Dias. On that score, there's some urgency for Canada and the U.S., both of which hope to regain a bigger share of the pie as the auto industry embarks on historic investments in the next generation of vehicles: electric and self-driving cars. While the U.S. list of objectives for NAFTA negotiations doesn't mention the auto sector specifically, it does call for stiffer rules of origin and more stringent, enforceable environmental and labour standards — which would have a direct bearing on the automotive industry. Unifor supports those American objectives. The union wants to see the rules of origin beefed up so that vehicles must have at least 70 per cent North American-made content — up from the current 62.5 per cent — to be eligible to move duty-free between Canada, the United States and Mexico. That's aimed primarily at forcing Asian and European automakers and Chinese producers of auto electronics to build more plants in North America. Automakers, however, are vehemently opposed to raising the minimum content requirement, which they argue is already the highest of any trade agreement in the world. "Any changes to the duty-free access and content rules will disrupt the highly integrated supply chains and reduce the massive benefits, undermining the global competitiveness of that integrated automotive industry we talk about," Mark Nantais, president of the Canadian Vehicle Manufacturers' Association, told the House of Commons trade committee last May. David Paterson, vice-president of General Motors Canada Ltd., reminded the committee that a vehicle built in North America can cross borders seven times during the manufacturing process. Tracing the content of every part already requires "a lot of bureaucracy." "Under the category 'do no harm,' we must set out to reduce, not add, red tape," he said. "We would prefer to see tracing eliminated." On this issue, the government appears to be siding with the automakers. Rather than focus on rules of origin, senior Canadian officials — speaking anonymously because they were not authorized to speak publicly on the matter — said strengthening labour and environmental standards would be a more effective way to reduce Mexico's disproportionate share of auto investment and jobs. The objective, one official stressed, is not to stop auto production in Mexico, but to close the wage gap so Mexican workers benefit while making the other two NAFTA partners more competitive. Mexico would not be averse to measures that would raise the standard of living for its workers, Canada's ambassador to the United States, David MacNaughton, suggested in an interview. "The question really is over what period of time and how you achieve that," MacNaughton said. "Also, we need to make sure that living standards and good paying middle-class jobs in Canada and the United States continue to be created, too. So the question is, can you find a way to create that win-win-win?" Currently, NAFTA includes side deals on labour and the environment — essentially just aspirational goals to improve working conditions and committing each country to enforce its own labour and environmental standards. That has allowed Mexico to take advantage of its low wage rate, lack of free collective bargaining and non-existent health, safety and environmental standards to lure auto companies looking for the cheapest place to set up shop, says Dias. That advantage would diminish if companies operating in Mexico were compelled to abide by standards similar to those applied in the U.S. and Canada. Dias advocates strict timelines for raising wages and penalizing companies that don't meet them. "There's going to have to be a wholesale change in the system," Dias says. "Corporations are going to have to be more responsible, they're going to have to start to treat people better, they're going to have to start to pay them respectfully."